We completed our first workshop in Dubai and had a great response. Thank you to everyone who attended. For those of you who we could not register because the course was full, we will be having further workshops at the end of the year in the Middle East. We are finalizing the dates and locations and they will be ready for registration shortly. If you would like to see what radiologists in Dubai thought of the workshop follow this link to our Facebook Video page where we have Dr Gandhi and Dr Mohammad speak about what they thought of the workshop. The workshop is now full and registrations have closed. Please click on the image above to see our other workshops. REA goes to the UAE. We will be holding our MSK Workstation Workshop in Dubai on the weekend of 31st March and 01st April 2017, covering the larger joints Knee, Shoulder and Hip over two days and with lots of time for for guided viewing of 100’s of dicoms of MRI pathology. As usual the focus will be on being able to analyse and report accurately actual cases of MSK pathology rather than just recognise solitary images from powerpoints. We hope you will be able to join us. Dubai Health Authority, HAAD and KIMS CEPD: HAAD have confirmed that they will recognise the CME points granted by the RANZCR as Category 1 points. KIMS CEPD have also indicated that participants can apply for recognition of attendance and CPD points. We are currently awaiting a reply form DHA and will update as soon as we have confirmation. Australian and New Zealand Radiologists: 33.5 RANZCR CPD points can be claimed for attendance at the workshop. RCR: RCR recognises CPD points awarded by international colleges and the points granted by RANZCR will be recognised. 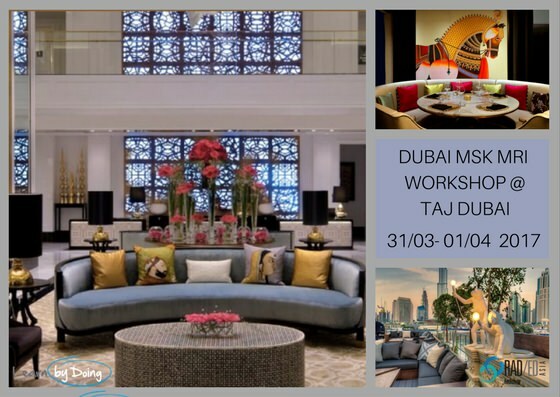 The Workshop will be held at the Taj Dubai. This is a very new and very impressive hotel and is close to the airport and Dubai Mall and will be a great venue. If you are planning to travel with family, the hotel has many activities for children with a specific Kids@Taj programme. Very new, very nice, kids club and close to Dubai Mall. Pack your spouse off with the kids whilst you learn in peace.